Pennsylvania representatives “really got an earful” last week from Pitt students, Student Government Board President Max Kneis said at Tuesday’s meeting. SGB held a phone banking event last Wednesday to Friday outside the William Pitt Union. The event gave students the opportunity to call congressional leaders who Kneis said were responsible for holding up the state budget — and Pitt’s funding. Students made more than 300 calls, Kneis said. Kneis said SGB emailed all the presidents of student organizations at Pitt and asked them to help advocate in support of the budget being passed. Several students who stopped to make calls had personal reasons for urging the representatives to stop stalling on passing the budget, Kneis said. 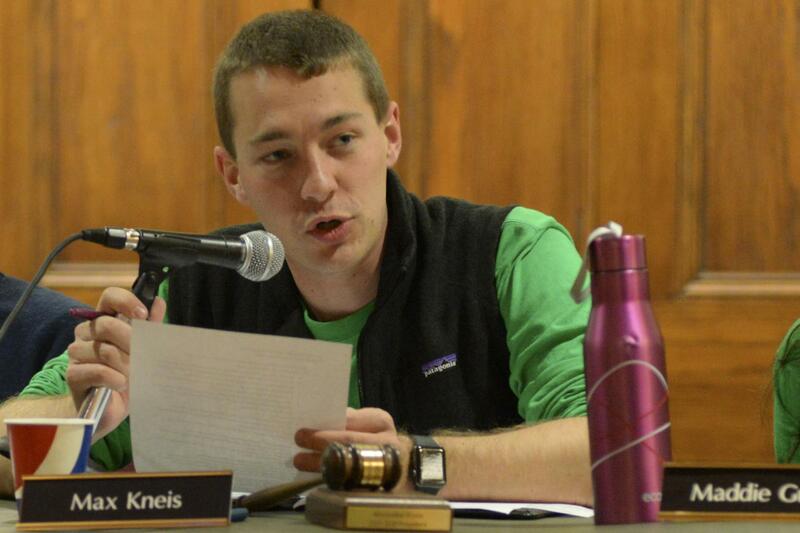 “A lot of students, and this is unfortunate, talked about how if tuition went up they might have to transfer to another school or drop out, and gave personal stories about how it’s important to them and their families,” Kneis said. Executive Vice President Zuri Kent-Smith said SGB held the first of three “DACA drives” Monday. Students signed pre-written letters supporting DACA-recipients which will soon be sent to their respective state representatives. The next one is Wednesday inside the basement of the Union. The last one will be on and Friday in front of the Union. At the first drive, students signed 52 letters in total — Kent-Smith expects at least 50 more from the next two drives, but is hoping for 100. Student organizations are also getting a helping hand from SGB. Vice President and Chief of Finance Maddie Guido — with the assistance of Kneis and Allocations Chair Cory Stillman — is compiling a student organization how-to guide, she said. The guide will include information on how to receive Sodexo catering for events, apply for allocations requests, find alternative funding and other necessities. Kneis and Guido were looking through old documents from past Boards and found a skeleton outline of a how-to guide that 2014-15 SGB President Mike Nites created. The manual is expected to be completed by the end of the semester and will be available through the Student Organization Resource Center and on SGB’s website. “Everything a student org[anization] needs to know is all in one place so they’re not running from website to website or office to office,” Kneis said. Vice President and Chief of Cabinet Krish Patel announced a peer mentoring initiative is in the very beginning stages of discussion. The potential program will allow trained juniors and seniors to mentor first-years and sophomores in their academic departments. “Pitt’s a pretty big university, so sometimes it’s really hard to get meetings with their advisers right away, but if you had these peer advisers you have a student perspective and they would also be trained,” Patel said. Patel said she got the idea from looking at other universities such as Duke, Northwestern and Penn State. “I remember reflecting back on my freshman and sophomore year and I was like, ‘I loved my advisers, I had very great experiences but I have also asked a lot of students randomly of just what they did and stuff,’” Patel said. SGB will not have a meeting Oct. 24, because the board members will be returning late from the Atlantic Coastal Conference Advocacy Days — a gathering in Washington D.C. of all the schools in the ACC, to advocate for students in higher education on a federal level. “I think it’s important to remind our federal elected officials what Pitt means to us and what federal money means to us as students and hearing that from us directly can be very impactful,” Kneis said. The Filipino Students Association requested $123.24 for a program expense. The board approved in full. The Ranger Challenge Club requested $1,906.57 for gym equipment in the Bellefield Hall ROTC lounge. The board denied in full. Pitches and Tones requested $250 for purchase, rental and service. The board approved in full. Quizbowl requested $1,174.92 for a competition expense. The board approved $1,071.56 and denied $103.36. The Panther Swing Dance Club requested $194.25 for purchase, rental and service. The board approved in full. Amnesty International requested $966.44 for a conference request. The board approved in full. Students for Liberty requested $239.48 for a conference request. The board approved in full. The Imagination Project requested $1,924.97 for costumes. The board approved in full. Engineers for a Sustainable World requested $450 for purchase, rental and service. The board approved in full. The Club Cross Country Team requested $1,184.34 for a competition expense. The board approved in full. Pitt Women’s Club Soccer requested $250.16 for a competition expense. The board approved in full. The Muslim Student Association requested $1,075.70 for a program expense. The board approved in full.